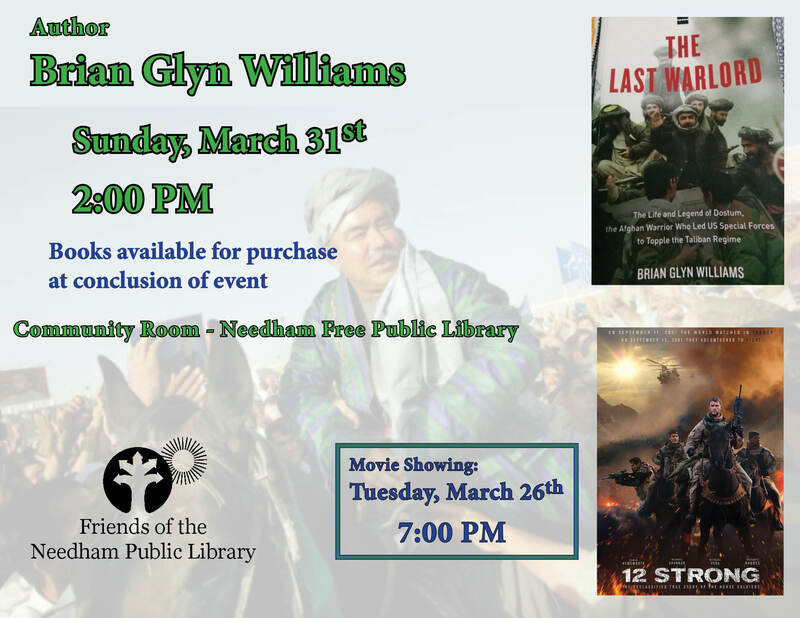 Author Brian Glyn Williams will discuss his book The Last Warlord: The Life and Legend of Dostum, the Afghan Warrior who Led US Special Forces to Topple the Taliban Regime. The Library will also be screening the Hollywood movie 12 Strong, which is based on the events described in The Last Warlord, in the Community Room on Tuesday, March 26, 2019 from 7:00-9:30 p.m. Dr. Williams was a contributor to the movie. The Last Warlord tells the post-9/11 story of a mysterious Afghan-Mongol warrior who helped the CIA and U.S. Special Forces liberate Afghanistan's holiest shrine from the Taliban. Dr. Williams lived in the remote Afghan mountains with the anti-Taliban warlord, General Dostum, whose wife was killed by fanatics. General Dostum offered the Americans an alliance after 2001 and his horsemen rode with U.S. Green Beret Special Forces on horseback to overthrow the entrenched Taliban regime in just 60 days, with just 300 U.S. boots on the ground in mountainous country. Dr. Williams will bring that epic covert campaign to life with remarkable photos and stories he captured during his time in Afghanistan. Dr. Williams is a professor of Islamic History at the University of Massachusetts at Dartmouth, and has worked in Afghanistan for the CIA's Counter Terrorism Center and in Kabul at a forward operations base for the US Army's Information Operations team. In addition to The Last Warlord, he has written Counter Jihad: America's Military Experience in Afghanistan, Iraq and Syria; Inferno in Chechnya: The Russian-Chechen Wars, the Al Qaeda Myth, and the Boston Marathon Bombings; and The Crimean Tatars: From Soviet Genocide to Putin's Conquest. Dr. Williams has also published articles in Newsweek, the Huffington Post, Jane's Intelligence Review, and Terrorism Monitor. More information about Dr. Williams' books and photographs from his fieldwork in war zones from Iraq to Kashmir are available at his web site. Books will be available for purchase, courtesy of Wellesley Books. For a higher-resolution version of this poster click here.